That was the advice given to me by my son’s Deputy Head as I left the staffroom to face my sons with the kind of news you hope never to deliver. Last week a good friend of ours went missing. Her son is in the same class as our eldest. Just Year 5, still at primary school. Our children had started school together, 5 years ago now. As soon as I heard that Aleasha had left home, on a foggy and cold Sunday afternoon and not returned that night, I knew something was wrong. We all did. Mums know mums. A request for ‘sightings’ had been issued by Essex Police. Aleasha was described as ‘vulnerable’… she had left home without her medication. We knew our friend was ‘out there somewhere’ and we were determined to find her. As soon as the boys were at school I sent a text to a mutual friend. Individually, we all began looking. Needles and haystacks come to mind. We visited ‘favourite walks,’ old walks and woodlands…our group of mums, texting each other, ever hopeful for an update. After school, we all drove the estates, crawling down the lanes, exploring long forgotten roadways with our children, all keeping our eyes peeled for Aleasha. A police search helicopter took over at nightfall. Our early sense of urgency was now growing amongst our community. My friend Mandy and I started a facebook event, to try and bring together as many people as possible to search for Aleasha. Late that night, Aleasha’s Army began to stamp its new collective feet and wanted to help. After increasingly strong talks with Essex Police we began to make headway. There is nothing quite as hard to ignore as a group of mums on a mission. The next day, just two days after Aleasha’s disappearance, we were assigned a Police Search Officer, our good friend and fellow mum, Steph. By now we’d sent out over 2500 invitations to the group and hundreds of people began to contact us for the posters we’d hastily drafted. Our army of two had grown. We wanted to find Aleasha. That was our simple mission. Police protocol is to give volunteers a ‘safe area’ to search – an area that is considered ‘low risk of a find’ but that will, it’s hoped, raise the profile of the case. We were assigned, with 30 minutes notice, Essex University. Mandy and I sent out a request to all those who might be free to join us. We spoke to journalists and contacted a good friend, and fellow mum, who worked at the university. She arranged a room, refreshments and was there, 30 minutes later, to welcome those friends, family and strangers who poured in to help us search. Over 100 people joined us. 10 police officers had been drafted in, led by our good friend Steph. We were relieved to be doing something collectively. We wanted to get our good friend home safely to her husband and little boys. Whatever you believe or don’t believe in doesn’t really matter here…but we prayed, wished and hoped to find Aleasha. We spread out over the extensive grounds of the university and in our groups of ten searched..and searched. We were scared, nervous…unsure…but most definitely determined. 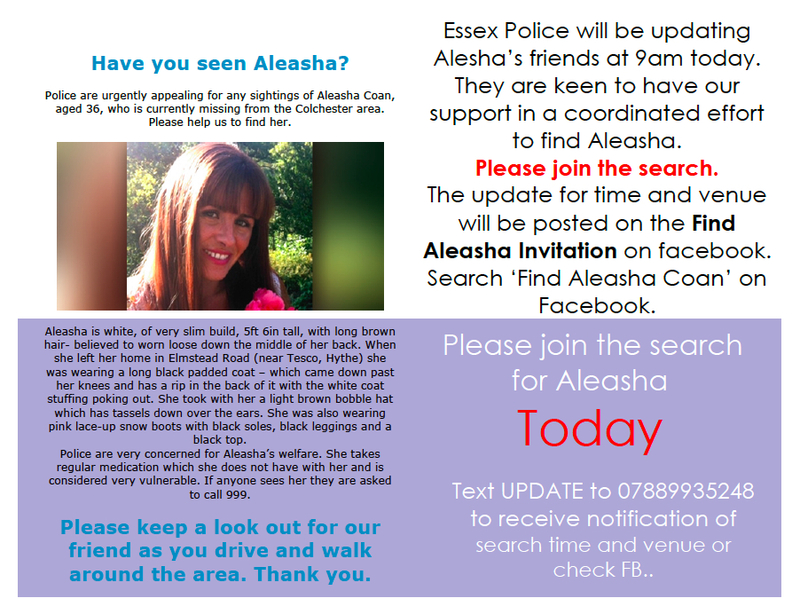 Within 2 hours Aleasha had been found. Sadly, it was not the happy ending we had hoped for. Tragically, Aleasha had lost her life. Our beautiful friend had been found dead. The stunned silence that followed was deafening. It filled the ‘briefing room’ with an air of total sadness. No one had told us at that point. But everyone knew. Somehow, we all knew she’d been found. It fell to our friend, Policewoman Steph Triscott, to take care of Aleasha’s family, the young PCSO who had found her and then to return to us all to give us the news that somehow we already knew. Mandy and I stood either side of Steph. We all held hands as she ‘did her job’ and told everyone that the search for Aleasha had now been stepped down. It wasn’t the outcome we hoped for but, our mission was to find her. Regardless. To bring her to a point of safety and to end the crippling uncertainty for her family. ‘Yes.’ I replied ‘We did’. ‘Is she ok?’ they asked. Three pairs of hopeful eyes, fixed upon my face. Their wise Deputy Head had suggested that ‘honesty is the best policy’… I was torn between wanting to get home to a safe and quiet place to tell them and their urgent need for information. ‘She is peaceful now,’ I explained. That was not enough. I was skirting the issue. ‘Peaceful?’ asked Callum. Three pairs of confused eyes, fixed upon my face. Searching for clues. ‘Unfortunately, Aleasha is no longer with us.’… I was skirting the harsh truth…desperate to prevent their safe world of happy endings from crashing down. ‘Yes. I’m sorry, she is’. There was silence for a few moments as I ushered them towards our car. As we shut the door, it was Thomas who broke the silence again. At last I was able to give positive reassurance. Yes, things were bad now. Yes, we were all sad. Our worlds had been turned upside down. Two little boys had lost their precious mummy. But, somehow, with love, support and kindness everyone affected would, one day, be ok. They would rebuild, not forget or stop hurting, but they would learn to live with the terrible news that was now part of our lives. Instantly, I remembered a time when we lost our third child through a miscarriage. Callum was only 3 at the time. He didn’t know why his mummy was crying. I explained that our baby had died and gone to be an angel. I will never forget his response. He cuddled me and then said… ‘Let’s be sad and go and look up at the stars to say goodbye and then let’s go out and play’. And that’s exactly what we did. We sat on our doorstep and looked up to the stars. Callum waved goodbye and then handed me his bike helmet! Despite feeling dreadful I walked alongside him as he lurched from side to side, stabilizers rattling, grinning from ear to ear. We laughed. He’d allowed me time for grief and then set me back on track for a good dose of happiness. My own work with the hospice movement and the loss of another good friend a few years earlier has taught me the importance of talking to our children. Communicating. Being honest with our feelings and listening to theirs. Not being afraid to show our own feelings. I answered their questions simply but honestly. It became clear that their own perceptions of death were each different. For Thomas it was just a fact shared. He thought immediately of the first pet they’d lost. A little chicken, Star that had been eaten by a visiting husky dog. A terrible disaster that they still recall in vivid detail! He wondered instantly what Aleasha was doing in heaven. ‘Do you think she’ll like God? he asked. ‘I wonder what’s it like up there!’ For Jack, I could see fear etched deeply into his little face. ‘Will you be so sad one day that you will want to die?’ He had instantly related the situation to the thought of losing me. It’s been over a week now and today was the first day he went to school without ‘a tummy ache, a headache, tears or an extra hold of my hand’. Callum wanted to speak to his friend. He wondered if Toby would ever be ok again. He felt sad. He also understood my grief and wanted to make that better. We were all trying to make sense of it. All struggling. But at least we were doing it together. It’s only 10 days since our terrible discovery. On Friday a photo of Mandy and I looking distraught, made front page news on Friday. We were just mums who had tried to find their friend. It felt like a private grief but the search and interest was, understandably public. Next to us, in a glamorous photo, was a smaller picture of our beautiful friend Aleasha. Shining as she always did. Sparkling even. Gorgeous as ever. ‘You look old,’ said Callum factually. Old, pale and exhausted. ‘Aleasha looks like a princess but you look a bit like Shrek!’ How true. In that moment, I couldn’t help but smile and I wondered to myself… is honesty really the best policy?I suppose it is. Even if sometimes, the truth hurts….